This is a capx project file for use with Scirra Construct 2, an HTML5 game creation program. 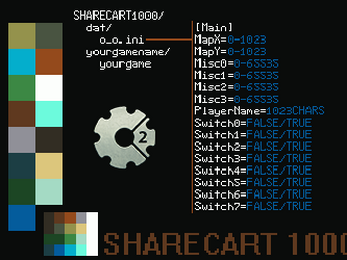 It allows your Construct 2 game to read and write to a SHARECART1000 o_o.ini file. You can read more about the SHARECART1000 system here. I put this together for my entry to the Teacart 1k, but I thought it may be useful to others! It took me a good chunk of time pre-jam to get it (sorta) working, but I continued to work on it post-jam as well. At this point, I think it's pretty solid and reliable, although I'm not a master of SHARECART/Construct/anything so I don't claim it to be perfect. Feel free to use it for your own projects! And let me know if you make any improvements so I can update my copy!